Why should art be on the chopping block before history class? I believe we romanticize history, making it seem practically and ideally more important than it is….If we want students to know the most important facts and stories about history for the sake of those facts, then having them watch a few documentaries should cover the bases pretty well. As Will Wilkinson pointed out to me, history is something anyone with reading comprehension can teach themselves, in contrast art is a skill that in most cases requires careful instruction. ….There’s also a large cognitive dissonance whereby we view art as being something soft, idealistic, unpractical, and unserious compared to other school subjects. Art is a fun distraction, whereas history is serious business. But of the two art is clearly the more practical real world subject. Many serious, button downed, grown-up careers require artistic skills: architects, marketing, graphic design, engineers, web designers, city planners… the list goes on. Which careers require knowledge of history? In defense of Adam’s view, it certainly seems to be the case that most history teaching goes for naught. Among the part of the population that knows history only from school, knowledge of history seems to be nearly nonexistent. So one might well wonder what the point is. Maybe we should just give high school juniors a year of watching History Channel documentaries and leave it at that. 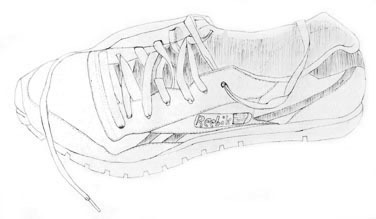 weeks after starting, I created the lovely drawing of a shoe that you see on the right. It’s no Rembrandt, but it’s surprisingly legible. You’d know what it was even if I hadn’t told you. Was this because I was tapping into the right side of my brain? Not really — although I think there actually was a bit of that involved. Mostly it was just instruction of the kind that seems like head-slapping common sense after you’ve read it. For example: Don’t look at the shoe as a shoe, look at it purely as a set of arbitrary lines and shadows of certain relative lengths and angles to each other. (Thus the stereotype of an artist with his arm outstretched and his thumb turned up.) Stuff like that. As it turned out, I quit shortly after I drew the shoe. It turned out that I wasn’t really interested in becoming a good artist, I was just curious to know if I could learn to draw. When it became obvious that the answer was yes, I got bored and stopped. Still, this goes to Adam’s point: you can teach pretty much anyone to draw tolerably well in a semester or so. Is this a skill that would continue to be handy throughout your life? Maybe. Unfortunately, one thing I learned in my short foray into art is that freehand drawing takes a helluva long time. That shoe took two hours to finish, according to my notes. But maybe if I’d kept at it for six months or so my speed would have increased. Anyway, I’m just rambling. I don’t have any real point to make here, aside from thinking that maybe Adam has a point. Or not. I’m not sure. There are an awful lot of things that it might be useful to teach our kids, after all, and we can’t teach them all.